Panes Bread Cafe is a small bakery in the Lakeview area. They bake fresh breads daily and offer many other pastries/cakes that everyone loves. 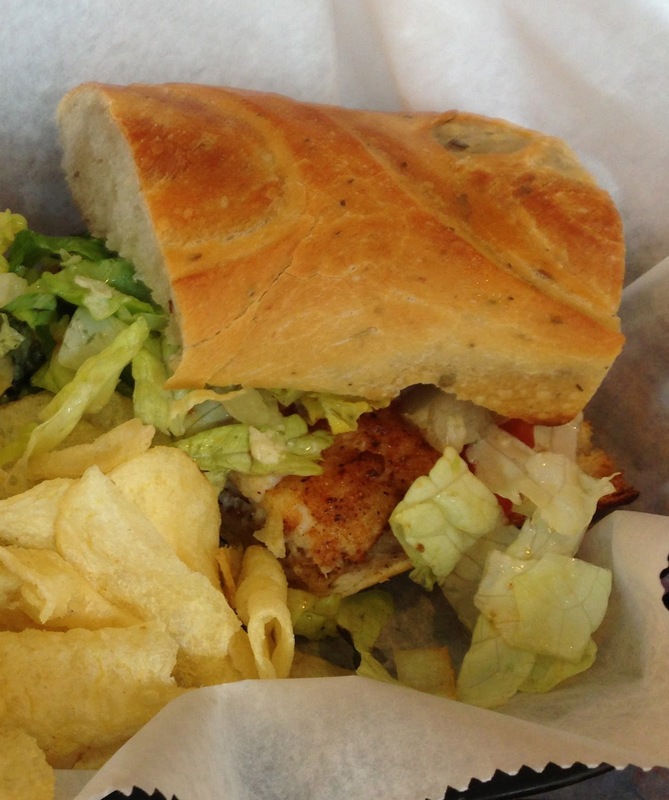 Besides baking, Panes also offers a variety of lunch and dinner options--from sandwiches and salads to pastas. Each is made to order, so a little wait will be in store. Overall, the uniqueness of some of their sandwiches and the reasonable price make Panes a great place for students and workers of all sorts to come for lunch. Unfortunately, some of their sandwiches are not thought out too well and seem to disappoint. Also, being a cash only establishment is sometimes difficult for people that haven't had a chance to visit an ATM in a while. I have personally been to Panes quite a few times (only took a couple pictures), and after giving it multiple chances, I still could only rate them at 3 miles. Much better than eating subway, but other places would be more satisfying. I decided the last time I went to Panes to try their daily special. Today was the blackened halibut sandwich. Served on freshly baked bread, the sandwich had two halibut filets sliced thin and heavily seasoned with blackening spice. It was seared to give that rich color and served on top of a bed of lettuce, tomato, and a garlic mayo. The sandwich itself is good size, especially for being just under $6.00. The bread had a nice crust, but was still soft in the middle. The veggies were all fresh and the fish was cooked perfectly... still moist and heavily seasoned. I wish the offered a different side than just regular potato chips which were haphazardly thrown onto my sandwich. Maybe something healthier like a side salad or fruit? Also, I think the sandwich needed more of a sauce. The mayo was nearly non-existent... maybe a chipotle sauce? Anyway, it was a good special, just lacked a few of the details. As described on their menu, this is the sandwich that is "always a winner." Unfortunately, I thought differently. Served on their house made tomato bread (similar to focaccia), this sandwich is filled with grilled chicken breast, caramelized onions, spinach, roasted peppers, and provolone cheese. The size is huge. They actually use an entire focaccia to make the sandwich. I was really disappointed in many aspects of this sandwich. First of all, the spinach was the BLAND... add salt and pepper when sautéing please. Second, the roasted peppers and onions were cold. Third, the bread was soggier and more oily than expected. And finally, there was no sauce to tie everything together. It honestly tasted like everything was made separately and just piled into a sandwich. I would avoid the popular despite its name... it seems like a sandwich you can get at home. - To order, just walk to the register and grab a menu sitting on top of their display refrigerator. Check out the specials on the wall and then order. They will give you a number so just take a seat. Water is self serve. After eating, clean up your table and bring the basket and number over to the ledge near the water station. I was confused the first time I went, but if you just watch the regulars, you will figure it out. - Definitely do not get fooled by the cans of soda lining the fridge. They charge nearly $2 for a can which is absolutely ridiculous. They do offer fountain drinks, but it is hard to see so if you want pop, order a fountain soda. - Not much street parking after 6PM since all the street parking turns back into permit parking only. So I wouldn't drive unless you are coming during the day.